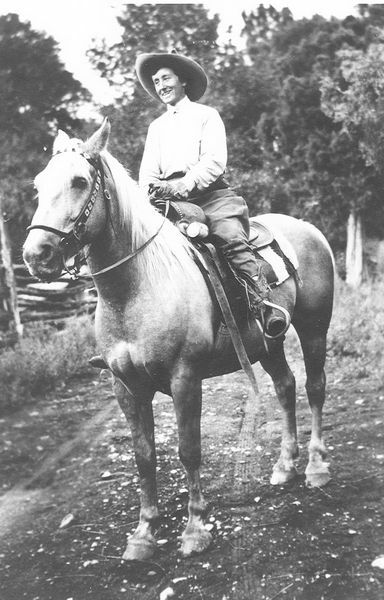 A young Marie Scott horseback in her earlier ranching days. Photo courtesy of Mario Zadra. Marie Scott spent her final days on a couch in the kitchen of her simple frame ranch house. She died peacefully on November 5, 1979, not far from the home where she had been born eighty-three years earlier. The place where she was to spend her last days had been of her own choosing — she had hoped not to die in a hospital. There were no children or grandchildren or, for that matter, any other close family with her to say good-by — to ease the passing. None existed. But friends were there —friends who passed for family — a family whose bonds were forged not with blood, but with those strong-as-steel ties that existed in the old ranching communities of the West. In the gaunt and wasted woman, there was no hint of the girl that Marie once had been. The abundant curly red hair was now thin and gray. Porcelain skin had weathered into leather from too many days in the sun. Eyes once the color of mountain bluebells now were a clouded and washed- out blue. Oh, but there had been a time when she had turned many a young man’s head — even though she might well have been able to outride, out shoot, and out cowboy even the best of them. All that was forever in the past now, and the worn-out Marie — her face haggard, her thin legs bowed, her hands gnarled and worn with work — had decided to die in the comfort of her familiar, almost shabby kitchen with its ancient cook-stove, linoleum floor worn off under the sink, geraniums spindly in the window sill, and a beloved dog and a few treasured cats nearby. There wasn’t really anything so unusual about any of this– except that almost everything you could see of the beautiful view from her window and more — she owned. Thousands and thousands of acres worth millions of dollars. And she had spent her lifetime and her life’s blood earning it. Marie was born on March 28, 1896, on the family homestead, which was located near Ridgway in the Dallas Creek valley. All around this area, ranches and fauns were springing up at this time. Her earliest experiences were of land and cattle and all that went with taking care of them. The seasons of ranching — spring calving, summer haying, fall roundups, and winter feeding — were ingrained in her psyche early on. After her father’s death when Marie was an eight year old child, her mother continued to run the Scott ranch alone, developing and enlarging it and eventually putting a very young Marie in the role of managing it. Management also included cooking which Marie was expected to do for the ranch’s hired hands. Surprisingly, she enjoyed it, becoming an excellent cook. She baked up scrumptious cherry pies in the kitchen when she wasn’t mowing hay in the hay field. Managing the family homestead wasn’t enough to satisfy Marie for long. Accounts vary, but when she was sixteen or eighteen years old — and having already stated in no uncertain terms that after the eighth grade, she was through with school, telling her mother that she would rather dig ditches; and having already collected something of a herd of cattle as best a young child could . . . strays and sickly calves, true, but a start in the cattle business — she next bought a place of her own. And so, before reaching the age of twenty, and with borrowed money, she owned her first small acreage: by the age of twenty-one, she was adding on to it. By her thirties, Marie was going along about like everyone else in the ranching business, when the Depression hit the small Ridgway ranching community hard. Marie survived it by hunting deer and elk and by trapping and selling pelts. Many others did the same. Even with the hardship, the Depression turned out to be a time of opportunity for Marie. She had gone to work for the U.S. Land Bank, and she was sent by them to Kansas City on business. Before she left, she sold some of her cattle at a railroad shipping point at a town called Placerville, which was located just over Dallas Divide, several miles from Marie’s ranch. Receiving part of her money for them there and the rest when they and she arrived at Denver’s stockyards, Marie was flush with $6,000 or $7,000, which she intended to wire home to her bank in Ridgway. Her mother may have changed the course of Marie’s life when, in a phone call, she relayed the news that the Ridgway bank had just folded. Marie was left in the enviable position of having a lot of Depression cash on her hands. Land prices were falling now, and some in the cattle business were having to sell out. Marie bought 3,000 cheap acres in Norwood, some thirty miles west of her home ranch. She was on her way. It was about this same time that Marie did something quite out of character — on September 28, 1929, in Telluride, Colorado, she got married. Whatever Marie’s logic was for trying matrimony, the marriage was probably doomed from the beginning. She was thirty-four years old, well used to her independence, and totally driven to complete her goals of buying more and more land, fencing it all in, and putting the finest Herefords behind the fences. A divorce soon took place, which was final on July 26, 1937, with Marie citing extreme and repeated cruelty. She bought out her husband’s holdings, a thing that few women of that time would have been able to do. Then she took back her maiden name. Marie’s “look” really never changed much either. She always dressed in Levi’s and had the curious custom of some of the ’40s-and ’50s-era cattlemen of only wearing new ones instead of washing them and wearing them again. Of course, she wore boots and western shirts, favoring the color red for her shirts and jackets. Until she was elderly, she was a natural redhead or an unnatural one, when her hair began to gray. Generous amounts of red rouge –“war paint”, she called it — was her trademark, as was the way she wore a Stetson-style hat well back on her head. She was short at five feet, slender, and more and more bow-legged as the horseback years added up. Marie was rarely seen in a dress, but she had her feminine side. She often had her hair done at a salon in Montrose, and she sometimes drank the coffee that kept her going from her mother’s pretty china cups. She wore an apron over her Levi’s when she cooked, and she could turn out as good a cherry pie or as flaky a biscuit as any housewife around. Just as Marie wore plain ranch work clothes — no beaded and fringed buckskin to impress upon people that she was a rich cowgirl — so was her manner of living simple. Marie’s ranch house, the one she lived in much of her life, was located at the heart of her Alpine Meadows Ranch near Ridgway. It was a modest and plain frame house with red trim, surrounded by the usual outbuildings, corrals, sheds, and barns of an everyday ranch. There was not one ostentatious thing about it, considering it was long lived in by one who literally owned most of the valley where it was located. Other than its great size, there was nothing about Marie’s ranch that advertised her formidable standing — it was indistinguishable from any other ranch in the area. Marie wanted it that way. Marie’s empire eventually reached so far beyond the view from her window that it’s simply hard to imagine. Her land continuously grew and shifted boundaries and changed hands to the point that it is hard to get a handle on what she owned in her lifetime. Generally speaking, she eventually owned land from her home ranch on Dallas Divide just west of Ridgway all the way west to the Utah state line and beyond. Marie claimed to have never counted it all up, but estimates of her holdings at the zenith reached from 60,000 to 100,000 acres. It was an extraordinary ranch comprised of vast stretches of hills and valleys, mountains, sagebrush flatlands, and green blooming meadowland. It was checkerboarded throughout with Bureau of Land Management and United States Forest Service lands and complex with water rights. Most of Marie’s land was located in several counties in southwestern Colorado including the whole of the basin of Dallas Creek. She also owned land in the central Colorado Rockies. In addition, Marie’s empire was studded with the gems of eight beautiful mountain camps. It was to these that her cattle and sheep were sent to graze during the summer months. For a long time, it seemed that nothing could stop Marie’s great ambitions. But “Old Father Time” eventually came to call, and Marie, who had gone at a breakneck pace well into her sixties, was finally defeated by old age. She simply gradually wore out and could be seen noticeably limping or napping beside the road in her red Jeep. Her eyesight began to fail and, in her seventies, she broke a knee cap and was temporarily confined to a wheelchair — her great vitality slowly began to slip away. At this time, Marie began selling much of her land, reducing her holdings to some 25,000 acres at the time of her death in what was undoubtedly an effort to spare her estate exorbitant death taxes. But it wasn’t enough to cheat the government, whose regulations she had often battled against. The IRS collected seventy percent of the value of the last of her land — nearly seven million dollars — at the time of her death. The State of Colorado collected about a million dollars to cover state death taxes. What was left was divided among twelve heirs — Marie’s friends and neighbors. Much of her remaining land had to be sold to permit equal division among her beneficiaries. Marie’s great empire was broken now into pieces large and small and was never to be the same again. The character and the purpose of her beautiful Alpine Meadows Ranch and her additional holdings — all bearing the stamp of her strong personality and the benefit of her singleness of purpose — was as lost as grass visited by prairie fire. Marie was buried not far from her home in a lovely small cemetery, the resting place for many of her life-long neighbors as well as many of her family. Under a pine tree, Marie Scott was put to rest in a wooden casket, wearing her western clothes — Levi’s and a red jacket. She had requested only a simple grave-side service. She had asked that instead of flowers, donations be made to a guide dog foundation. She left behind very few people who were close enough to her to know her well, and these, if they survive, still guard her privacy as she would have wished. Much has been written of her, often times repetitive — the “Calamity Jane” vignettes that have been told and retold so many times. What drove Marie Scott to such heights of ambition for acquiring land and to sacrifice all to that goal remains something of a mystery — and she would have wanted it that way.